Game of Thrones Actress Emilia Clarke was spotted on the Red Carpet wearing Dolce & Gabbana White Rose Print Dress in London at the Centerpoint Awards 2018. As part of the “All the Lover’s Collection,” this luxurious white & rose print dress is also available in a Mini-Me Look for Spring Summer 2018. 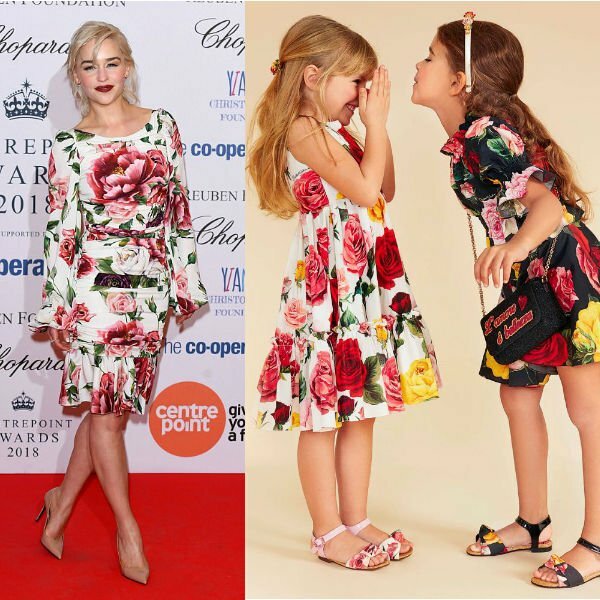 Made in lightweight cotton, this pretty dress for Mini-me girls has an opulent rose print also seen in Dolce & Gabbana’s adult collection. The full skirt has a tier of ruffles near the hem for extra volume and it fastens with a zip on the back. This pretty special occasion dress also comes in baby sizes for a little sister.